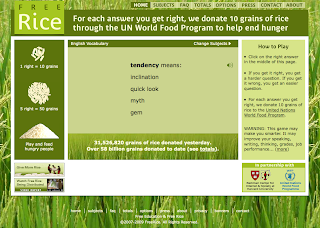 Free Rice started back in October 2007 and have been growing exponentially. They've already passed 2008's total just from Janurary of this year! :D I have to admit, I'm horrible with vocab terms, but they have levels and make it easy yet challenging. Please check out the site, play a little when you got the time, donate a few rice grains and spread the word. ;) Hope everyone's enjoying their weekend!